A Northern California county says it has received more than 100 missing-person reports as family and friends scramble to locate loved ones while wildfires ravage the state. Scott Alonso, communications director for Sonoma County, says the reports have come via calls to a hotline the county set up for the missing. It is possible that many or most of the missing are safe but simply can’t be reached because of the widespread loss of cell service and other communications. The firestorm consuming the state has killed at least 10 people, seven of whom were in Sonoma County. More than 5,000 Southern California homes were evacuated Monday as fire crews struggled to battle a rapidly growing brush fire. The blaze has scorched 6,000 acres and destroyed dozens of structures in Orange County. Plumes of smoke were visible over Disneyland and officials issued air quality warnings for parts of Los Angeles County. An Anaheim police spokesman says there is no containment so far. The firestorm consuming the state has killed at least 10 people and injured at least a hundred. At least 100 people have been injured in wildfires burning in Northern California. St. Joseph Health said 100 patients have been treated, most for smoke inhalation, at two of its hospitals, Santa Rosa Memorial in Santa Rosa and Queen of the Valley Medical Center in Napa. Those hospitals took on the majority of patients with other hospitals in the area evacuated because of the fires. Two of the injured are critical. One has been transferred to a burn center with significant burns. Fifteen of the injuries are described as moderate and the rest are minor. The number of injured is expected to climb as information comes in for all the other areas affected by the firestorm consuming the state. The fires have also killed at least 10 people and destroyed at least 1,500 homes. Former San Francisco Giants pitcher Noah Lowry and his family were among those who had to flee from the ferocious series of wildfires in Northern California. Lowry told The Associated Press that he, his wife, his two daughters and his 2-week-old son had to leave their home in Santa Rosa in a matter of minutes as the flames approached. He said he ran into a closed U.S. 101 freeway because the flames had jumped it. But he and his family were able to get away in time and get to a friends’ house where they are staying. Lowry, who pitched for the Giants from 2003 and 2007, now owns an outdoor sporting goods store in Santa Rosa. The fires have destroyed at least 1,500 homes and killed at least 10 people. Vice President Mike Pence said during a visit to California that the federal government stands ready to provide any and all assistance to the state as it deals with deadly and destructive wildfires. It wasn’t clear whether Pence’s statements meant the request from Brown and several local leaders will be met. The fires have destroyed at least 1,500 homes and killed at least 10 people in Northern California. The Napa Valley Vintners association says most wineries were closed Monday because of power outages, evacuation orders and the inability of employees to get to work. The trade association said Monday that it does not have verifiable information on winery buildings that burned down or the impact the fires would have on the 2017 harvest. Workers had picked most grapes for the season before fires broke out. The wind-driven wildfires came as Napa and Sonoma counties were finishing highly anticipated harvests of wine grapes. Workers on Monday should have been picking and processing the ripe grapes that would make chardonnay and other wines. At least two wineries were destroyed and many others damaged. Authorities have imposed a sunset-to-sunrise curfew in the city of Santa Rosa and say they are on the lookout for looters as firefighters battle blazes raging in California wine country. Acting police Chief Craig Schwartz said Monday the curfew will be enforced in a mandatory evacuation zone, with violators possibly subject to arrest. Other officials said they were beginning to get reports of looting in areas affected by fires. Santa Rosa has about 175,000 residents. Officials say at least seven more people have died in fast-moving wildfires in California wine country, bringing the total number of fatalities to 10. The Sonoma County Sheriff’s Office tweeted Monday that seven fire-related deaths were reported from fires there. California fire officials reported earlier that two people died in Napa County and one died in Mendocino County. Trailer park residents in California wine country had little time to escape before flames destroyed their homes. Nancy Cook said Monday that her dogs alerted her to the wildfire that quickly came blowing over a hill early in the morning and ignited trees in the Journey’s End trailer park in Santa Rosa. The fire is one of the most destructive of more than a dozen in the region. Cook says she pounded on neighbors’ doors before fleeing with her husband, dogs and medications. She and other residents didn’t have time to round up their cats and had to leave them behind in their haste. Some fled in their pajamas and left their wallets. One person had to abandon a classic hotrod car that burned. Cook says she thinks everyone in the over-55 community escaped, though most residents lost everything they owned. Authorities say at least half a dozen homes have burned in a fast-moving brush fire in Southern California. Anaheim Sgt. Daron Wyatt says the fire that broke out on Monday had stretched to about 4 square miles. Wyatt says the blaze has been driven westward by winds toward heavily populated areas of Orange County, prompting authorities to expand evacuations. Wyatt says one firefighter suffered minor injuries fighting the blaze. An overnight shelter has been set up at a nearby high school for evacuees. Authorities have expanded evacuations in Southern California’s Orange County because of a fast-moving wildfire. Anaheim police Sgt. Daron Wyatt told KABC-TV on Monday that residents in the neighborhoods of Orange Park Acres, North Tustin and East Orange were also being evacuated. Television cameras showed homes charred by flames in the hilly area known as Anaheim Hills. At least 1,000 homes in that area were previously evacuated. Residents reported ash falling miles away in areas near the Pacific Coast. Regional authorities have issued a smoke advisory through Tuesday morning for portions of Orange and Riverside counties. Officials say a wind-driven wildfire churning through canyons in hilly neighborhoods of Southern California has burned multiple homes. Anaheim police Sgt. Daron Wyatt says there’s still no count of the number of homes affected by Monday’s blaze. Anaheim Fire & Rescue says the fire has grown to 2,000 acres and is being fought by 200 firefighters, six helicopters and six airplanes. One firefighter has been injured. The fire erupted during the fall’s first significant blast of Santa Ana winds, which blow out of the northeast and toward the coast. At least 1,500 homes and commercial buildings have been destroyed, and 20,000 people have been evacuated. Officials say at least one person was killed and two others were seriously injured in fast-spreading wildfires in Northern California wine country. CalFire said Monday the death and injuries occurred in Mendocino County, one of several counties struggling to contain a total of 14 major fires burning out of control. Official say high winds are hampering firefighting efforts about 140 miles (225 kilometers) north of San Francisco. A wind-driven wildfire has ignited homes in a Southern California subdivision. TV news helicopters over the blaze in the Anaheim hills of eastern Orange County are showing several homes fully involved and flames spreading in others Monday afternoon. Fire crews are scrambling to protect structures. Evacuations have been ordered for neighborhoods and two elementary schools. The fire erupted during the fall’s first significant blast of Santa Ana winds, the seasonal gusts linked to some of the region’s worst wildfires. In Northern California, wildfires overnight have destroyed at least 1,500 homes and commercial buildings, and 20,000 people have been evacuated. Authorities say they expect fatalities after 14 fast-moving wildfires destroyed more than 1,500 homes, department stores, hotels and other commercial structures in Northern California. The state’s top fire officials said Monday that firefighters have focused on evacuating residents and saving lives rather than battling the blaze and protecting buildings. California Department of Forestry and Fire Protection Director Ken Pimlott said fatalities are expected, but the fires are still out of control and it’s difficult for authorities to assess the damage done and the number of people hurt and killed. He said about 50,000 people are without power. October is typically the most dangerous time for fires in the state. He said there have been 1,500 more wildfires this year than last year at this time. The California Highway Patrol says numerous roads are closed in the fire region, which is an eight-county swath of wine country north of San Francisco. A wind-driven wildfire is sweeping along the outskirts of a Southern California subdivision. The blaze erupted at late morning Monday in Anaheim and moved rapidly through hills and canyons in Orange County, about 45 miles southeast of Los Angeles. Authorities have ordered evacuations of neighborhoods and two elementary schools and shut down heavily traveled freeways. City officials could not immediately say how many people are affected. An evacuation center is being set up at a downtown community center. Authorities also are setting up a place for residents to evacuate their horses. In Northern California, firefighters are battling blazes that have destroyed at least 1,500 homes and commercial buildings. 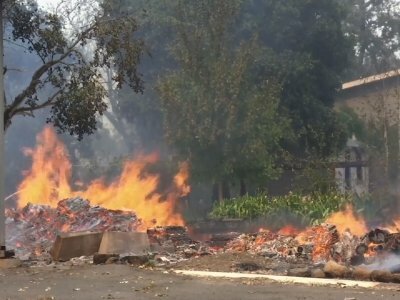 Emergency workers and staff at a state home for the severely disabled outside of Sonoma have evacuated all of about 240 patients as flames from fast-spreading wildfires approached the center and ash rained down. Officials at the Sonoma Developmental Center, located on 900 acres, in the town of Glen Ellen said there were no known injuries during the evacuation. Crews got all patients from threatened buildings as flames closed within a few dozen feet of the center’s buildings. Many of the patients were confined to beds and wheelchairs and had breathing or feeding tubes. Vans and school buses were lining up to remove the last patients as workers in masks pushed frail residents in wheelchairs across parking lots and roads. Another wildfire has erupted in California, this time about 45 miles (72 kilometers) southeast of Los Angeles in the hill country of eastern Orange County. The Anaheim Fire Department says the fire erupted late Monday morning and is being pushed by 25 mph winds. An unknown number of people have been ordered to evacuate. Much of Southern California is under red flag warnings for fire danger due to the fall’s first significant Santa Ana winds, the seasonal gusts linked to some of the region’s worst wildfires. The Anaheim fire erupted as the tally from numerous fires in Northern California worsens. State officials say at least 1,500 homes and commercial buildings have been destroyed, and 20,000 people have been evacuated in California wine country. California’s fire chief says at least 1,500 homes and commercial buildings have been destroyed in wildfires that have ripped through the state’s wine country. He says numerous people have been injured and a number of residents are also missing as 14 large fires burn. California Department of Forestry and Fire Protection Director Ken Pimlott say an estimated 20,000 people have been evacuated. He called the estimates of destroyed structures very conservative. Pimlott says the fires are burning throughout an eight-county swath of Northern California, including Napa, Sonoma and Yuba counties. Pimlott said most of the fires started at about 10 p.m. Sunday and their causes are under investigation. He said firefighters are concentrating on saving lives rather than battling the blazes. He didn’t have an estimate on the number of people hurt and missing. More than 200 people were hurriedly evacuated from two Santa Rosa hospitals threatened by wildfires that bloomed overnight. Lisa Amador, a spokeswoman with Sutter Health, said around 9 a.m. that Sutter Santa Rosa Regional Hospital had finished evacuating the last of more than 80 patients in surgical, labor and emergency care. She says the hospital is sending staff home. Amador says the hospital and the medical office building next to it are intact, but other structures are ruined. Jenny Mack, a spokeswoman for Kaiser Permanente, says about 130 patients were evacuated from the Santa Rosa medical center Monday morning. She said all appointments and surgeries are cancelled for the day in Santa Rosa and Napa, and the KP medical offices in Napa are closed. California Gov. Jerry Brown has declared a state of emergency in Napa, Sonoma and Yuba counties because of wildfires that the governor says are threatening thousands of homes. Brown issued the declaration on Monday, as multiple fires forced people to evacuate their homes. Napa County Fire Chief Barry Biermann said more than 50 structures had been destroyed, but there were no reports of injuries or deaths. Residents describe terrifying middle-of-the-night scrambles to flee from raging wildfires. Biermann says the fires had burned more than 68 square miles (176sq. kilometers). Residents in Napa and Sonoma counties are describing their terrifying middle-of-the-night scramble to flee from raging wildfires. Terri Ruttledge, who lives on Adobe Canyon in Kenwood, just made it out before the fire burned her house. Ruttledge says she looked out her window and saw the mountain across the road on fire. When she couldn’t reach 911, she quickly loaded up the car and fled. Mandatory evacuations were ordered after blazes broke out late Sunday. Napa County Board of Supervisors chairwoman Belia Ramos says officials do not yet have a count on how many properties have been affected in the 20,000 acre (8,100 hectare) fire. She says the wind gusts were tremendous and made the fire unpredictable. Fires also burned just to the east in the Napa County wine country as well as in Yuba, Butte and Nevada counties. Residents of Northern California wine country are describing harrowing escapes from wind-whipped wildfires. Marian Williams says she caravanned with neighbors through flames early Monday as one of several fires reached the vineyards and ridges of the small Sonoma County town of Kenwood. Williams says she could feel the heat as trees turned into torches. The fires are being fanned by strong, dry and gusty winds raking the region. Firefighters are battling several wind-whipped fires that forced evacuations of rural neighborhoods in Northern California. The Press Democrat reports (http://bit.ly/2xt7ekR ) that mandatory evacuations were ordered after a blaze broke out late Sunday near Santa Rosa, which is 54 miles (87 kilometers) north of San Francisco. The Sonoma County Sheriff’s Office says deputies were dispatched to help firefighters and California Highway Patrol officers with evacuations. Multiple fires broke out Sunday night as strong winds buffeted the area. Emergency lines were inundated with callers reporting smoke in the area. Downed trees were blocking parts of one rural road and fires were burning on both sides of Highway 12 as gusts reached up to 60 mph (96.5 kph). Cal Fire says firefighters were battling a 200-acre (80.9-hectare) fire in Napa County.